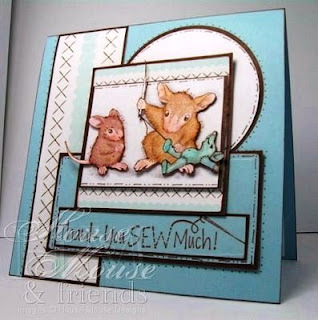 Cards by America: House Mouse Monday Challenge CH#29 - A Sketch! 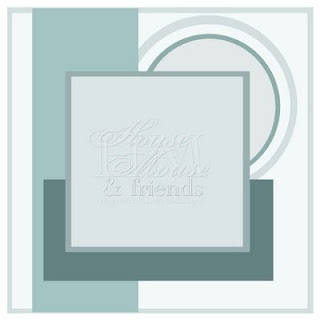 House Mouse Monday Challenge CH#29 - A Sketch! These stamps are by Stampabilities, House Mouse Designs and the main stamp is called: "Sew What", #HMUR1065 - featuring Monica & Amanda. I dont know why, but i seem to be on a "blues" colors and shades lately! LOL. I used a new fun Designer Series Paper Pad from Making Memories that just so happened to be blue and have a few sheets in it that sort-of resembled stitches - so I went for it. I pierced between all the X's and doodled in some of my own FAUX stitches & added dots. The images are twice stamped, colored in with Marvy LePlume Markers, cut and layered for added dimension. The needle was colored in a silver glitter gel marker. Oh I totally love this!!! Your popped up mousies are so cute - wow, what a cutting job!! GREAT card! What a great sketch and you did such a great job with it. I love those mice popped up like that, just darling. I LOVE how your little mice are hanging over the square and the 'stitching' is an awesome addition. Great card!! I flipped over your card when I saw it this morning. It's awesome. I tried leaving a comment and it wasn't even on your blog yet. You did a great job on this! ((THUD!!) Somebody pick me up off the floor and revive me!! OMG!! I LOVE THIS! This is adorable! I love all the stitching and the fresh colors! Wonderful job! LOVE this!!! What an awesome card! You rock! I just love it!! Fabulous colours and papers and I love how you've utilized the stiching - brilliant. Those little mousies just pop from the page. OMG! This is sooooo cute! A beautiful and cute card! What a lovely card, a great take on the sketch! You know what I love most about those little mice? They make me smile everytime I see them. They are so cute! You did a fabulous job on this card! Such a cute card, America. Love the colors that you used and always your lovely coloring!! The color combo is fabulous and that sentiment is too cute!! Awesome job! I love this. The stitching image goes perfectly with what looks like stiches on the DP!